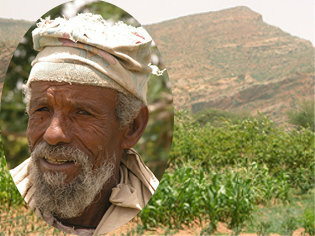 "We will be self-sufficient," said Gebremichael Giday, chairman of Abreha we Atsebeha, a village high in the arid uplands of northern Ethiopia, about 45km from Mekele, capital of the Tigray region. He is confident that in another 10 years they will not need food aid. The village, named after a rock-hewn medieval church perched on one of the mountains that surround it, lost 60 people in the famine of 1984. Then a food-for-work programme was set up to help rehabilitate the eroded land. "All you had to do was build terraces to prevent rainwater from rushing down the hill-slopes - the soil then acts as a sponge and absorbs the water," said Giday. This is a form of watershed management; Ethiopia loses 1.5 billion tons of topsoil to erosion every year, a major contributor to food insecurity, according to World Food Programme (WFP). It took 10 years for the water table to rise, allowing villagers to dig shallow wells for irrigation. Now, orchards and community gardens lush with maize and vegetables surround the village. "We are blessed," Giday commented. Kahsai Gebremariam, an Ethiopian government official and coordinator of Managing Environmental Resources to Enable Transitions to More Sustainable Livelihoods, a programme developed by WFP and implemented by the government - also known by the acronym, MERET, meaning "land" in Amharic, the local language - said the village was blessed to have such a chairman. MERET provided Giday with the opportunity to learn about cross-breeding techniques and obtain new seeds for quick-growing varieties of maize. Since then he has cross-bred mangoes with apples - a delicacy that fetches good money in the markets of the national capital, Addis Ababa - and has introduced many new vegetables to the villagers. "Before they would only eat cereals - now they know they can live on vegetables and fruits and also make money," said MERET coordinator Gebremariam. Farmers from neighbouring villages visit regularly to compare methods and swap tips in the farmer-to-farmer exchanges that are part of the programme. Almost all the villagers earn a living from their produce, but some still need aid during the lean seasons. "It has been getting tougher with the rains," Giday acknowledged. "What will we save when the rains become more scarce?" Melake Brhanat Tesfay Gebremariam, 72, a farmer who lost a one-year-old son and a daughter aged six in the 1984 famine, looked at the harsh landscape beyond the gardens. "Now things are different," he said in Amharic. "It would have been different for my children, but I think the best thing to do now is remember them with fondness." He harvests three times a year. "I have enough food for my family. At least five million people in Ethiopia need food aid every year, but the idea of food aid is not popular in government circles and there is concern about increasing dependency on aid. Tewolde Egziabher, who heads Ethiopia's Environmental Protection Authority and is effectively Minister of the Environment, said he liked the objectives of MERET but would have been happier if the food aid provided for watershed management (the food-for-work programme) were given as a loan. WFP spokeswoman Judith Schuler pointed out that when they start a MERET project in a food insecure and degraded area, "People have basically nothing, and many of them tell me that they would have left the area without MERET - they spend their day looking for food," and beneficiaries "only receive food assistance during the initial stage of the project" - 3kg of maize per day for three months.